The lomo is one of the most appreciated sausages in the Spanish gastronomy, and the higher its quality is, the more our palate enjoys it. That is why at Enrique Tomás we offer you the best selection of Iberian lomo and Gran Reserva so that you can enjoy a delicious product in every bite. And, because we know that your comfort is the most important thing, in our online store you can buy this product in different presentations. 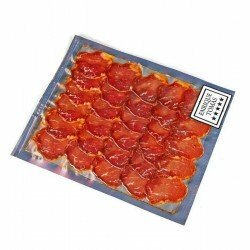 ¼ of whole loin, half loin, cut by knife or machine and vacuum packed or our incredible packs with bellota 100% iberian products made up of ham, lomo, salchichón and chorizo from the best origins: Salamanca, Huelva, Cáceres - Badajoz and Córdoba. Delight yourself with only the best! 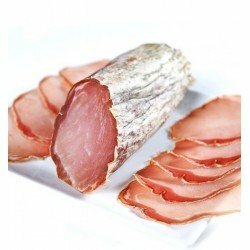 Buy loin online and receive it in the comfort of your home with the guarantee that you will be able to enjoy a product of the highest quality and much flavor. In Enrique Tomás we know that sausages are an important part of our gastronomy, that is why we take the same care in their selection as in our star product, ham. 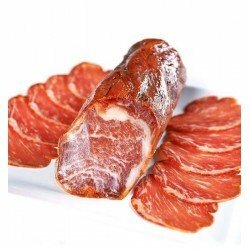 Our Iberian lomo comes from the best Iberian pigs, produced from one of the noblest pieces of this animal, located in the dorsal part, an area that combines the almost total absence of external fat with the internal veining of the Iberian breed. On the other hand, our Gran Reserva presentation is made from white pork, the same that gives rise to the Gran Reserva or Serrano ham, being the first step in the quality of this product, with a slightly salty flavour that makes it ideal for sandwiches, snacks or for any occasion. Although each cook has his or her own recipe for lomo, traditionally the marinade used to make this sausage has paprika, oregano, salt, garlic and a dash of olive oil, ingredients that give it its characteristic flavour. In this marinade the piece will remain for a couple of days and when the process is finished it will be stuffed into the animal's own gut, which is why it is customary to call it a stuffed loin. The lomo, either Iberian or Gran Reserva, is usually bought as a whole piece for the consumer to cut and enjoy it to their liking, so at Enrique Tomás you can buy it in pieces from ¼ and half a lomo. 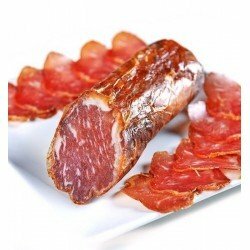 But when it comes to buying loin online, we try to offer you the greatest variety, so you can also enjoy this product cut by knife, sliced by machine or in packs of Iberian pork. Delicious and varied options for you to enjoy an excellent product, pride of our gastronomy.